Weebly​ is one of the easiest-to-use—and most popular—website builders on the market today. 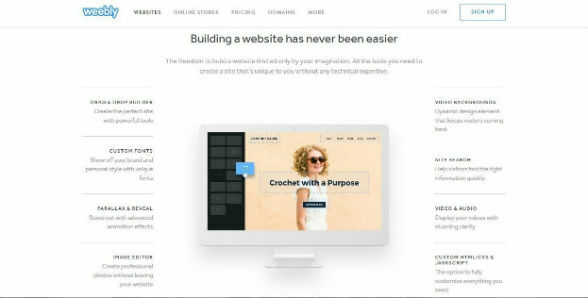 People with no previous technical or artistic experience find Weebly is both intuitive and straightforward, helping them create professional-looking sites without having to hire web designers or graphic artists. Weebly’s ready-to-edit templates and themes are part of what makes the site so easy to use. Weebly has about 100 themes on offer, all of which come with pre-designed layouts. All you need to do is pick the one you want to use, and you’re ready to customize it with your information. All of Weebly’s themes can be used for free. Which means that you can choose, edit, and publish any template you would like; the catch is that Weebly ads will be displayed on the site, and your site itself will be under the weebly domain (for example, https://top10templatesandthemesreview.weebly.com/). Anyone who wants to eliminate Weebly ads, hold their own domain name and use additional features has the option to upgrade to one of Weebly’s paid plans, which are quite competitively priced. Weebly offers 4 paid plans: Starter, Pro, Business, and Performance. Each level up comes with additional features. Weebly’s Business and Performance plans are good options for small business owners who want to use their websites to sell merchandise. No matter which option you choose, the templates don’t change. Whether you use Weebly for free or pay $38/month, you will still have access to the same templates. Because this is the case, users who are hesitant about paying for website services can do a “trial run.” First, you can create a website using Weebly for free, and if you like what you see, you can then upgrade to one of the paid plans. Four popular templates on Weebly are Haberdasher, Birdseye 2, Cento, and CleanLines. The names of the templates don’t necessarily give you a clue as to what kind of templates they are, so you have to take a look and actually click on them in order to get an idea as to which template will work for you. Haberdasher: A sleek, classy template that is suitable for anyone in the fashion business. Its style is clean and crisp, attractive but not gaudy. Features include responsiveness, CSS buttons, vector social icons, full-width header image, navigation top, color palettes. Birdseye 2: A versatile template that’s all about the photos. Visitors to a Birdseye site will see your photos first, making it a good choice for sellers who want to grab consumers’ attention. Features include responsiveness, CSS buttons, vector social icons, animation, fixed navigation, full-width header image, and top navigation. Cento: A minimalist theme that’s all about the content. Great for bloggers, artists, and photographers. Features include responsiveness, fixed navigation, boxed width, CSS buttons, vector social icons, top navigation, and boxed header. CleanLines: A universal theme, appropriate for shops, consultants, nutritionists, and service businesses. Features include full-width headers, dark and light color schemes, responsiveness, CSS buttons, vector social icons, top navigation, and color palettes. Below are 2 sites that were created using paid versions of Weebly. You can tell that the websites are using paid plans because their domain names do not include “Weebly,” and there are no Weebly ads. You’ll notice how each website is in a totally different field and each has different features. 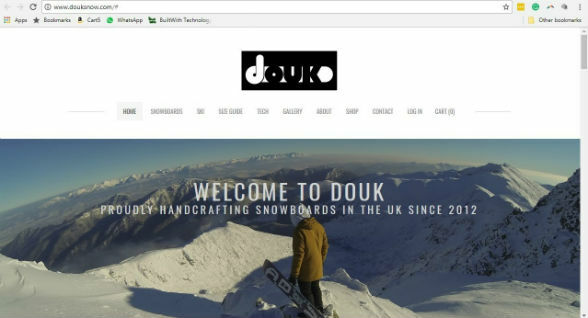 Douk is an online store for snowboards based in the UK. As you can see below, the home page is bright and crisp, with a clear top menu for easy navigation. Users can click on the menu options to take them to where they want, or scroll down. Checkout is done on the site itself (not through Weebly), which means that the creators opted for the Business or Performance package. 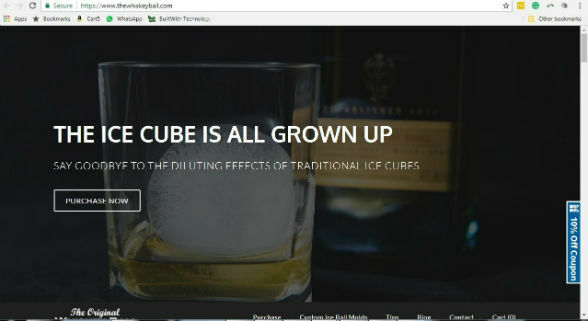 The Whiskey Ball is another online store with a very focused niche: ice cube trays and other accessories for alcoholic beverages. As one might expect of such a site, the design is sleek, and users can easily find the product they want and purchase it. Note also on the lower-right hand side that there is a 10% off coupon—another feature that Weebly Business and Performance plans support. Now that we know what kind of templates Weebly offers, and what features are available on them, let’s take a look at how it compares to some top competitors: Wix, GoDaddy, and Deluxe. Selection: Wix offers approximately 600 templates, whereas Weebly offers 100. This huge difference is not necessarily bad, as sometimes, too big of a selection can make your choice harder. On the other hand, some may prefer to have a larger selection. The choice is up to you. Style: Wix templates are generally more intricate and detailed, whereas Weebly’s themes are generally more simple. Again, whether this is a good or bad thing will depend largely on your personal preferences. GoDaddy doesn’t offer free templates; you can sign up for a 30-day free trial, but after that, you’ll need to pay if you want to maintain your website. GoDaddy chooses your template for you; when you sign up, you tell GoDaddy what kind of website you want, and the site chooses a fitting template for you. (You can then edit and customize as you wish.) Some may like having the choice taken out of their hands, whereas others may prefer to do the choosing themselves. Deluxe is more similar to GoDaddy than to Weebly. Just as GoDaddy asks what kind of website you want and hands you a template, Deluxe does pretty much the same thing, only it gives you more. You tell the Deluxe what you want, and then the company’s designers create it for you, which you then have the option to customize. Like GoDaddy, there is also no free version of Deluxe; plans start at $60/month for a 5-page business website. While the cost is significantly higher than Weebly’s plans, it may be cheaper than hiring a private website designer, and even the smallest plan includes professionally written content, domain name, email address, hosting, and email marketing. Which means that it may be preferable for you to pay more and receive more, rather than paying less and doing more work yourself. Or it may not be - the choice is yours. Weebly templates are simple and professional-looking; you can choose from approximately 100 themes that can be easily edited and customized to suit your individual needs. All templates can be used and published as websites free of charge; however, when you use the free version of Weebly, your website will be under the Weebly domain and include Weebly ads. If you opt for a paid version, you can get your own domain, along with other benefits.